Our selection of wide-seat lift chairs offers plenty of options for users who prefer a roomier alternative to the other models we offer. 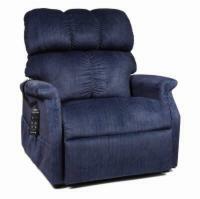 You'll never feel squeezed or cramped again once you've experienced sitting in one of these lift recliners. 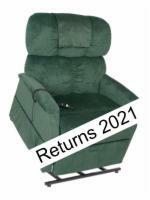 Browse our selection using the site map below, or call 1 (800) 797-4654 for assistance from our liftchair experts! Petite size and wide seat to comfortably lift and support even our smallest customers, we highly recommend this 3 position lift chair from Pride. In addition to the exceptional features that you have come to expect from a Golden Lift Chair, the PR501XW provides an extra wide frame and an increased weight capacity for added stability. Truly a work horse among lift chairs. 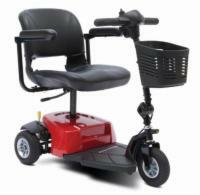 Dual motors and solid construction combine to provide a 500 lb capacity that guarantees a smooth lift. The best feature of this chair may just be the price. Big and Tall! 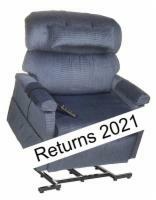 We realize that finding the right lift chair can sometimes be a challenge. That is why we have teamed up with Golden to offer this large dual motor lift chair at a price that no one else can match. This extra large chair can lift anyone up to 500 pounds and still cradle them like a baby when it's time to lay back and relax. Plus, it's built with heavy duty components throughout. 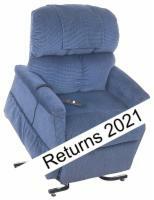 Features integrated battery backup, deluxe arm and head covers, and removable seam-back design. 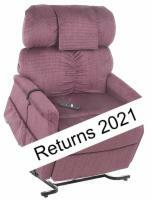 The extra-wide seat and dual motor construction will provide years of reliable service. 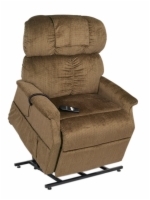 The Golden PR502 Heavy Duty Bariatric Lift Chair features top quality construction from top to bottom to provide a smooth lift and reliable operation for those that need a high capacity lift recliner.